In the local library’s semi-annual book sale, I found a prize: All the Gallant Men: Theh First Memoir by a USS Arizona Survivor. Everyone knows what happened at Pearl Harbor on December 7, 1941. How much do you know about the sailors who manned the ships and what they experienced? The Arizona shouldn’t have been at Pearl. It was scheduled to leave for the Bremerton, Washington, shipyard for an overhaul in late November. In late October, however, the ships were out on maneuvers and, on a very foggy October 22nd, the USS Oklahoma got out of sync and collided with the Arizona. The result was a hole “big enough to drive a hay truck through.” Time in drydock to patch the hole delayed the trip to Bremerton and on December 7th, the Arizona was still at Pearl. Several bombs that hit the Arizona proved to be duds. But one bomb pierced four steel decks and exploded in an ammunition magazine. With a whoosh, the ship blew up in a series of explosions. 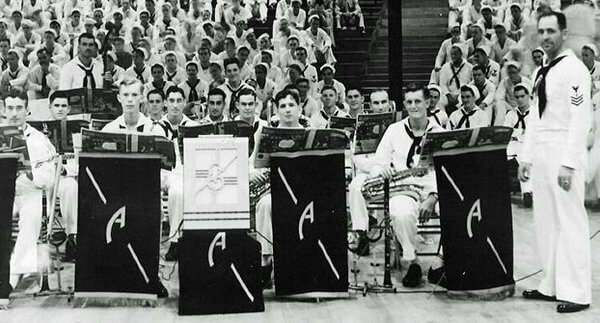 Among the 1,177 sailors killed were all twenty-one members of the Arizona’s band. The band members had attended the U.S. Navy School of Music where they studied ear training, harmony, and music theory, and had private instruction on their instruments. Eight bands had been assembled, graduated in May of 1941, and assigned to ships. Band #22 drew the Arizona. 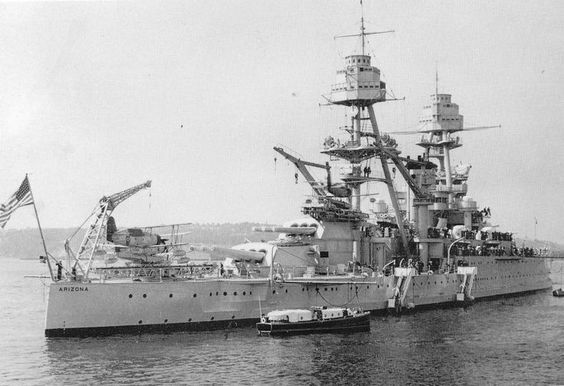 Three of the other bands also headed to battleships at Pearl: the California, Tennessee, and West Virginia. Band #22 caught up with the Arizona on June 17 in San Pedro, California. Even before checking out their quarters, the band went topside and played a concert, stunning the ship’s crew. The previous band had been older and hadn’t trained to play jazz or modern dance music. The crew loved having a band that played music like the big bands back home. Up and down Battleship Row on December 7, bands assembled on their fantails to play the national anthem during the raising of the flag at eight o’clock. The band on the Nevada jumped the gun and was already playing when the attack began. After a slight hesitation when the bandmaster noticed enemy planes strafing them, the band completed the anthem, then ran for their battle stations. Battle station for the bandsmen was the ammunition hold. They manned the hoists to take ammunition to gun turret number two. Seamen placed cloth powder bags on the hoists and the bandsmen, standing in rows on each side of the hoists, made sure the 75-pound bags did not become dislodged or snagged. A spill of black powder would create a hazard if a spark ignited it. At 8:06, the bomb penetrated the magazine. The bandsmen and over a thousand other sailors never had a chance.